Show the things that are to come hereafter, that we may know that ye are gods: yea, do good, or do evil, that we may be dismayed, and behold it together. Behold ye are of nothing, and your work of nought: an abomination is he that chooseth you. A couple of days ago I was perusing the most recent shows done by the Hagmann Report, and noted that the July 13, 2016 broadcast, had been entitled DHS Insider Information Revisited On the Hagmann Report. I listened to the first hour in which Doug brought up the name of Rosebud, the DHS Insider; a name which both he and Canada Free Press had heavily pushed to the forefront four years ago, during an election year. One scenario which had been promoted back then, was that Obama would institute martial law under a crisis, thereby setting aside American Presidential elections. Doug Hagmann in this most recent broadcast suggested that if the audience knew how the nickname Rosebud came about, we would all laugh. Of course he does not give us this elementary back story, as we are not to be insiders to this little joke. And so we fall back on our human capacity for word association, and most likely we will be accused of having a wild imagination, should we dare to venture the wrong answer, but most especially, if we select the right interpretation of this image. So here we are in 2016, another election year with Obama serving his last term, awaiting the illusive choice of monied interests as to whether Hillary Clinton or Donald Trump will be the next President of the United States of America. So here is a real curiosity I discovered. On November 24, 2015 INFOWARS posted a 3.27 minute video of none other than Donald Trump in a piece called, Trump on Citizen Kane: The Significance of Rosebud. If you are down in the dumps about the upcoming election, view this video, and enter into the real twilight zone of the American ruling class, and experience relief that they do not sit as God on the throne of mercy. When I was in high school around 1967, my English class studied the making of classic movies, which included Citizen Kane, where the word Rosebud entered into the stream of consciousness of the American public. The main character is based somewhat loosely on the Hearst newspaper empire, which was the father of yellow journalism and 24/7 news and entertainment reporting. 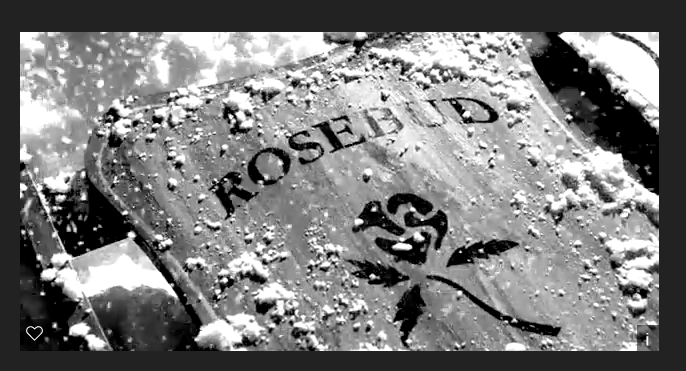 The last word of the dying Kane in this movie was Rosebud, which was his childhood sled. This image represented the innocent happiness he once had known, which had been replaced by his ever increasing desire for fortune and power, a strong citadel which he constructed only to exclude that real happiness which can never be purchased for money. An interesting review of this movie can be found at the guardian.com in an April 25, 2015 piece by Peter Bradshaw titled, Citizen Kane and the meaning of Rosebud. In a February 6, 2013 YouTube video we find a short mention of Rosebud, the DHS Insider given by Joel Skousen in an interview with Jeff Rense on December 26, 2012. This is noted as “Joel gives his opinion of the DHS Insider “Rosebud” that feeds information to “alternative news” journalist Doug Hagmann”. Skousen’s opinion, by the way, is that Hagmann has presented the public with a fake insider. The comment section of this video displays the usual finger pointing accusations that Joel Skousen is the one who is a disinformation shill, whereas others in the Alternative Media are the real deal, and vice versa. This is Yellow Journalism at its best, shaping history and public opinion by dialectical reasoning. Some of us still long for genuine leadership which relies on genuine evidence and those principles which are foundational to truth. 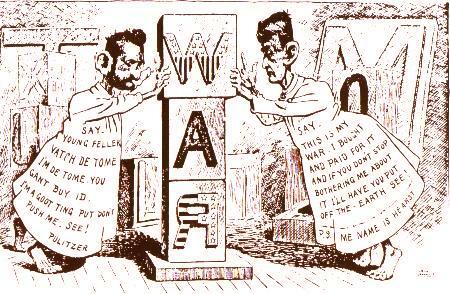 As Citizen Kane was based on the story of William Hearst, the father of Yellow Journalism, it is interesting to note that the keynote historical war which Hearst turned public opinion on, was also manipulated by another man, Joseph Pulitzer. Together they became master builders of WAR, as children who construct with wooden blocks, – at that time, printer’s letter blocks. Hearst and Pulitzer are both discussed in this spanamwar.com article on the Spanish American War Centennial’s page on the life of William Randolph Hearst. So here is what is interesting in the most recent promotion of Rosebud, the DHS Insider by Doug Hagmann. In the July 13th, Hagmann Report video linked to above, Hagmann quotes from, and promotes the reading of an article dated July 13, 2016 written by Judi McLeod the editor of Canada Free Press called Obama will only impose martial law if it looks like Trump will win. Rosebud, Trump, Election Year, Martial Law? One seldom considers the Canadian influence upon the American Alternative Media propagandists, but the partnership of Judi McLeod with Doug Hagmann in “discovering” and promoting the DHS Insider Rosebud, not to mention W The Intelligence Insider, should not be overlooked. I recommend going to the Canada Free Press website, and entering Rosebud into their search box. This will bring up various past articles written primarily by Doug Hagmann publishing his DHS Insider’s opinions and warnings, most of which history proved were wrong. On December 28, 2013, the EU Times sought to reassure us that finally we were freed from Rosebud‘s hidden knowledge once and for all, when they reposted a Doug Hagmann article under the banner, DHS Insider gives final warning. In addition to writing articles for Canada Free Press, as a Senior contributing writer, Douglas Hagmann used to make use of his old website which had the identical name, department of homeland security, as that of the DHS government agency. But in fact, Hagmann had created his website before the creation of the government agency, in case you are wondering which came first, the chicken or the egg in this particular situation. Hagmann was also known under the North East Intelligence Network banner as well. At KenWelch.com, there still remains an article written on September 11, 2006, called BUSTED: Doug Hagmann and Northeast Intelligence Network. And of course forums which repost insider disinfo are always interesting if you want to document the trail of Doug Hagmann. For example, in February 2013, ten months before the supposed finality of Rosebud’s revelations, the forum Whenshtf.com published a thread called, DHS Insider Rosebud: Back With Shocking New Revelations. But why not give Alex Jones’ INFOWARS forum the last word? After all, he did post that interesting video on Trump discussing Rosebud. And on June 20, 2013, the topic in his forum was Hagmann’s DHS Insider: MARTIAL LAW IN TWO WEEKS (Updated). Do any of you remember when that happened? Rosebud and his promoters have reappeared once again this month, in regard to Trump, the upcoming election, race wars, and martial law. It is always prudent to be prepared for any critical event, but after having the pantry stocked full and the guns loaded, why not sit back in your wicker rocking chair on the front porch, and just enjoy the warm summer evening. Prophetic failures are a dime a dozen in the Alternative Media, so do not be surprised in this twilight zone if you see Doug Hagmann and Judi McLeod sledding downhill on Rosebud, whizzing through yet another story line, kicking up snow and blurring the lines between sanity and insanity once again. But take notice that the backdrop behind all these predictions is the standing challenge of Isaiah 41:23-24, quoted in the heading of this post; a challenge made by the LORD God to those gods of predictive programming. When one enters into the employ of the U. S. government, various oaths are required, depending on the nature of the position held. Underlying such employment are also laws designed to protect the integrity of the lawful records and documentation of communications of government operations. 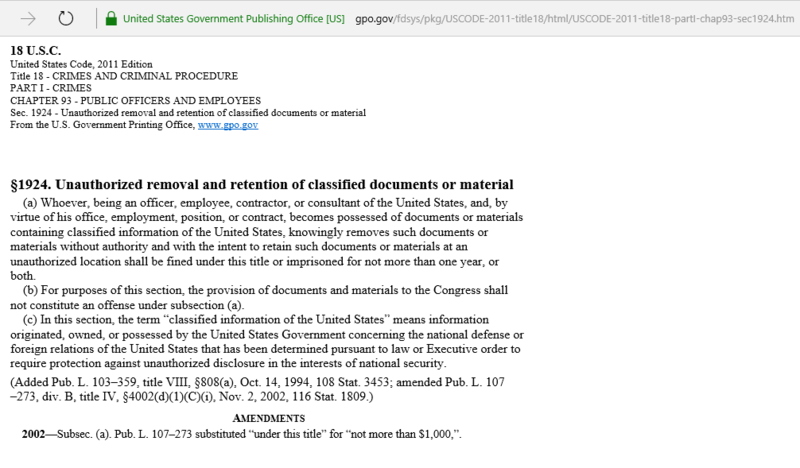 For example, the following screenshot is taken from the United States Code, Title 18, Crimes and Criminal Procedure, on Public Officers and Employees, Section 1924, on Unauthorized removal and retention of classified documents or material. This code was used as a basis for investigating General Petraeus for mishandling classified documents. On February 24, 2016, The Washington Post published an article by Michelle Lee He Lee, called Why the Clinton email scandal and Petraeus leak are not really alike, giving various facts which display the differences between the two cases. This well written article remarks in its introduction, “Petraeus, a respected four-star general who many believed would run for President one day, resigned as CIA Director in 2012 amid a criminal investigation. He faced potential felony charges and imprisonment, after the FBI discovered he had provided classified information to Broadwell, and lied to the FBI about it, enraging agents”. So here we have a rather curious system of authorizations involving the classification of information. Government employees may be required to sign a Classified Information Non Disclosure Agreement. But there are certain overriding authorities given, which may be granted by Executive Orders, which allow a government official to declassify top secret information to a lesser classification; or conversely, retroactively reclassify unclassified information to a higher designation in order to prevent making public information which had been requested by a FOIA request. In our analogy, we find the house of him that sweareth falsely, whereby the definition of perjury is made of none effect. This is done via a system which can (one) reclassify documents, not merely for the sake of correcting classification errors, but also to release top secret information to those who do not hold that level of permission, and (two) retroactively reclassify documents to prevent the public from reading what had been unclassified information prior to a Freedom Of Information Act (FOIA) request being filed. God has ordained Government for purposes of the lawful use of power over a nation. Psalm 50, which was written by Asaph, speaks of Zion as the perfection of beauty, but ends with a warning in verse 16, saying But unto the wicked God saith, What hast thou to do to declare my statutes, or that thou shouldest take my covenant in thy mouth? Seeing thou hatest instruction, and castest my words behind me. When thou sawest a thief, then thou consentedst with him, and hast been partaker with adulterers. Thou givest thy mouth to evil, and thy tongue frameth deceit. So here we also have the house of the thief, wherein specified government documents which are top secret are stolen and illegally given to someone without the proper clearance; and vice versa, documents which are permitted to be read by the public are stolen by reclassifying them as secret. This presents an interesting scenario when considering the case of Hillary Clinton who set up a private email server which involved transferring government documents outside of secure authorized government mechanisms. The other scenario of interest involved the methods used to steal government documents which were later revealed by WikiLeaks. So I entered the word WikiLeaks into the search box of the WikiLeaks archive of Hillary Clinton’s emails. Within some of these emails, whether revealing or concealing secrets, is that curse going throughout all the earth of the two sides of a flying roll; one side representing the house of the thief, and the other side, the house of the false swearer. Proverbs 29:24 declares, Whoso is partner with a thief hateth his own soul: he heareth cursing, and bewrayeth it not. The Hebrew word for cursing in this verse holds a peculiar irony, for the Strong’s Concordance word #423 is spelled alah. Now there is something to ponder. In response to the questions posed above in Hillary Clinton Email # 1054, may I suggest that an insider with a private email server could be positioned to be a middle man in such revealing and concealing of secrets? I am not saying that Hillary Clinton was the middle person, but certainly she displays a method by which this scenario might play out. Perhaps some of you might want to search out some of Hillary Clinton’s emails out of curiosity. Who knows what has been revealed and concealed in these flying scrolls through cyberspace. Proverbs 5:6 declares one of several warnings against the Strange Woman, Lest thou should ponder the path of life, her ways are moveable, that thou canst not know them. When I was a teenager and first introduced to the mathematics of physics, I was astonished that mathematics could represent and calculate the flight of an arrow. Indeed, vector analysis uses the image of the arrow to represent magnitude and direction. Many of the arrows in the Old Testament have their source in the LORD, as deliverance, as chastisement, as a return blow on wicked archers, who employ bitter words. When I was studying Mouni Sadhu’s teachings on the Tarot, it was notable that each card had an aspect that was represented by a different form of an arrow, all based on a false theory of the Tetragrammaton. And so today I am going to ponder an interesting phenomenon spoken of in I Kings 22:34 which is contained in the phrase I have highlighted with bold lettering: And a certain man drew a bow at a venture, and smote the king of Israel between the joints of the harness: wherefore he said unto the driver of his chariot, Turn thine hand, and carry me out of the host; for I am wounded. One of the common synonyms for venture is “to expose to hazard, fate, or destiny”, and so the archer in this verse of scripture drew his bow, without aiming for a particular target, and let go of the arrow. How it went from his quiver to his bow and released to sail through the air, to fulfil the prophesy of Ahab’s fall at Ramoth-gilead, makes for an interesting vector analysis, so to speak. Back in 2001, I observed how an arrow forged from words had hit its target, creating a deep spiritual wound which took some five months to recover from. Later, when I started studying the gematria of the Scriptures, I remembered the words which were the bow which sent that particular arrow in a direct hit. The words which had been used as a weapon were Wounded in Battle, and the scripture quoted had been I Kings 22:35. The interesting thing I noted about the Hebrew gematria of this verse is that it equals 3003, which is also equivalent to the Hebrew gematria of Daniel 5:27. Both scriptures are quoted at the top of this post. The word venture in its archaic sense means “trusting to chance”. Balaam, who I consider to be the model of the leopard Meroz, displayed a loose regard for quoting the words given him by God, while at the same time proclaiming his faithful application of the words of God. As a prophet with a lying spirit, Balaam became as a “certain man who drew a bow at a venture”, speaking some of the most important prophecies in the Old Testament of Israel. And so we read one of his lies spoken in Numbers 24: 12-13, which came back to haunt him: And Balaam said unto Balak, Spake I not also to thy messengers which thou sentest unto me, saying, If Balak would give me his house full of silver and gold, I cannot go beyond the commandment of the LORD, to do either good or bad of mine own mind; but what the LORD saith, that will I speak? In all of this we need to recall the warning of James 3:8-10, But the tongue can no man tame, it is an unruly evil, full of deadly poison. Therewith bless we God, even the Father; and therewith curse we men, which are made after the similitude of God. Out of the same mouth proceedeth blessing and cursing. My brethren, these things ought not so to be. How important are our words and the source of the fountain from which those words spring? The answer is that words are very important, for we read in Luke 20:19 after Jesus spoke of the stone which the builders had rejected, the chief priests and the scribes the same hour sought to lay hands on him; and they feared the people: for they perceived that he had spoken this parable against them. And they watched him, and sent forth spies, which should feign themselves just men, that they might take hold of his words, that so they might deliver him unto the power and authority of the governor. There are various methods of overturning the words of God, while appearing to have noble motives. The laying in the Balances of Judgment, false weights constructed by the deceitful use of gematria, which substitute one scripture verse with another, is a critical method of warfare through the use of guile. The source of such a technique is Satan himself, and it is the servants of Satan in the hidden realm of this world which release such arrows as noted in Psalm 64:3-4, Who whet their tongue like a sword, and bend their bows to shoot their arrows, even bitter words: that they may shoot in secret at the perfect: suddenly do they shoot at him, and fear not. The story we are considering today however involves similar principles and begins with a visit of Jehoshaphat, the king of Judah, to Ahab, the king of Israel. I Kings 22:4 tells us that Ahab asked Jehoshaphat if he will help him take Ramoth in Gilead out of the hand of the king of Syria. Jehoshaphat agrees and asks Ahab to inquire at the word of the LORD, but Ahab instead gathers 400 false prophets who all agreed that it was the will of the LORD to go up to battle. Jehoshaphat, whose name combines Jehovah with Judged, asks, Is there not here a prophet of the LORD besides, that we might inquire of him? There was one true prophet nearby, Micaiah; but he is in prison because Ahab hates him for prophesying evil against the king. When Micaiah is brought forth and states the same prophesy as the false prophets, Ahab becomes irritated by the sarcasm of Micaiah. After that the true prophet speaks the truth forthrightly. It is interesting that King Ahab does know that his false prophets have spoken falsely; yet he cannot seem to bring himself to hear the truth spoken, so when Micaiah speaks the true word from the LORD, and it does not agree with Ahab’s desires, he is further irritated. 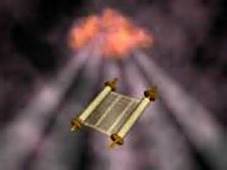 Then Micaiah says (verse 19-23), Hear thou therefore the word of the LORD: I saw the LORD sitting on his throne, and all the host of heaven standing by him on his right hand and on his left. And the LORD said, Who shall persuade Ahab, that he may go up and fall at Ramoth-gilead? And one said on this manner, and another said on that manner. And there came forth a spirit, and stood before the LORD, and said, I will persuade him. And the LORD said unto him, Wherewith? And he said, I will go forth, and I will be a lying spirit in the mouth of all his prophets. And he said, Thou shalt persuade him, and prevail also: go forth, and do so. Now therefore, behold, the LORD hath put a lying spirit in the mouth of all these thy prophets, and the LORD hath spoken evil concerning thee. So here we have an interesting scenario of a lying spirit doing the will of God. And as Daniel 5:27 represented something weighed in the balances as part of a prophesy of the imminent fall of Babylon, we also see a weighing in the balances in I Kings 22, which resulted in the imminent fall of King Ahab. We are going to step back from this scene for a moment and consider the philosophy of Kyudo: the Way of the Arrow as related by Jeri Massi, a Christian woman who also is a martial arts master. Her words are excerpted from her book, Letters to Lynn Redgrave: Martial Enlightenment for Modern Women (and Men), published in 2014. We have just been considering how the LORD can commission lying spirits to bring about His will, in the case of a historical battle and the death of an evil king. So why not also take a short look at the battle philosophies developed by godless men, for there may be a golden nugget of truth in what they propose. “Yet the masters unfailingly hit the black area of the target again and again… Eugen Herrigel, the first Westerner to become a Master of kyudo…would later demonstrate this same feat of skill in his native Germany. The archer, he explained, actually aims at himself. He is not shooting a separate entity called a target. Rather, the target (like the bow and the arrow) is an extension of himself on which he focuses his mind….What unites the archer to the target? Obviously the arrow does. He is the bow, and he is the arrow, and he is the target”. After pondering this Oriental perspective, we return back to see how King Ahab became the bow, the arrow and the target, resulting in his death. We recall that Ahab had called in 400 false prophets, but Jehoshaphat desired the word of a true prophet, and Micaiah was brought forth to speak the word of God to Ahab. Ezekiel 14:1 tells of certain elders who made enquiry of the prophet Ezekiel but the LORD answered in verse 4, Therefore speak unto them, and say unto them, Thus saith the Lord GOD; Every man of the house of Israel that setteth up his idols in his heart, and putteth the stumblingblock of his iniquity before his face, and cometh to the prophet; I the LORD will answer him that cometh according to the multitude of his idols; that I may take the house of Israel in their own heart, because the are all estranged from me through their idols. The LORD commissioned a lying spirit to persuade Ahab to go up and fall at Ramoth-gilead. To circumvent this, Ahab went into battle in disguise; whereas he instructed Jehoshaphat to wear his robes, making him identifiable as the only king at the scene of the battle. The king of Syria had commanded his 32 captains to ignore the small and the great and to target the king of Israel, exclusively. Thus Jehoshaphat almost lost his life, when the Syrians pursued him, thinking that he was in fact Ahab. When he cried out, his life was spared. It was after that, that a certain man drew a bow at a venture, smiting the king of Israel between the joints of the harness, wounding him so that his blood flowed out in the midst of his chariot. Thus was fulfilled the spiritual principle laid out in Ezekiel 14, and signified in verse 8 which says, And I will set my face against that man, and will make him a sign and a proverb, and I will cut him off from the midst of my people: and ye shall know that I am the LORD. Thus in our Vector Analysis of “a certain man drew a bow at a venture”, the great balances of the judgments of the Order of the Leopard have been examined, according to the principles laid out in the Scriptures. The fatal flaw of Ahab, king of Israel was that he knew his 400 prophets prophesied falsely in order to tell him what he wanted to hear. And he knew that the true prophet Micaiah, in speaking evil against him, spoke the word of the LORD truly. TEKEL: thou art weighed in the balances and art found wanting was forged into an arrow with the magnitude and direction of an executioner of death, and the king thus wounded, died at evening.